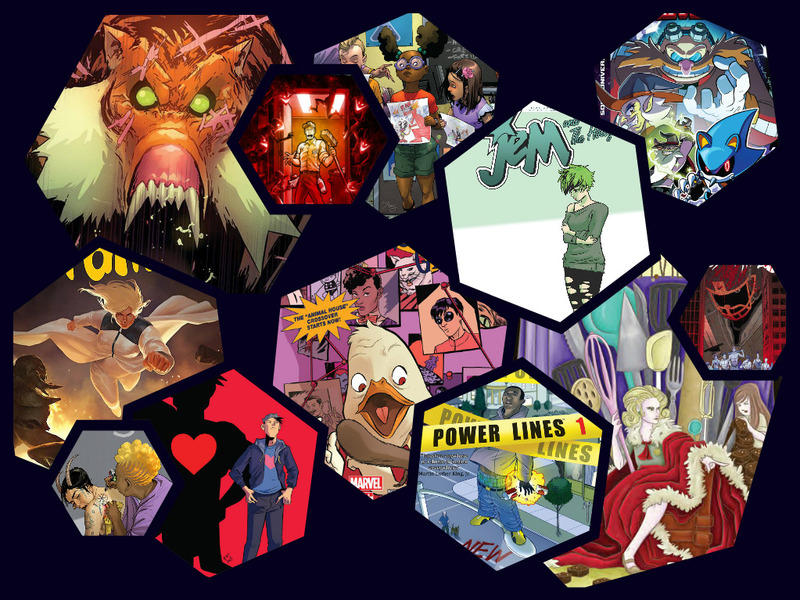 New comic book day has arrived and with it some great new reads and continuing adventures. 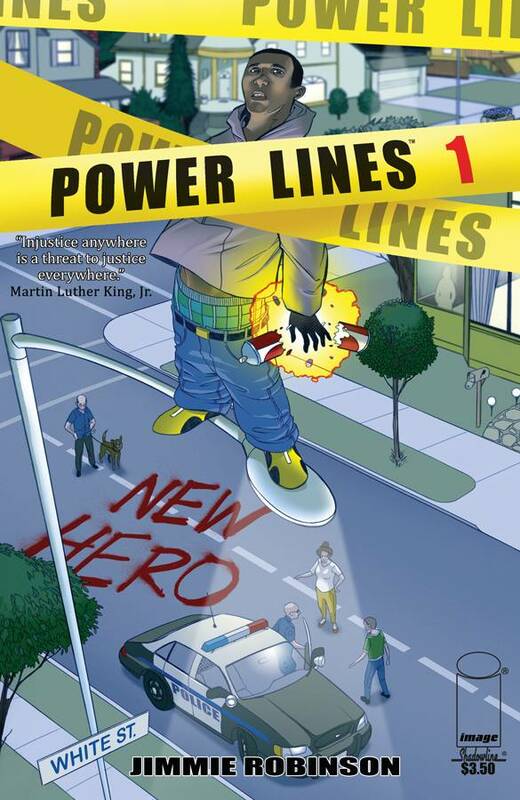 New this week are Power Lines #1 by Jimmie Robinson and Suiciders: Kings of HelL.A. by Lee Bermejo and Alessandro Vitti. Continued greatness can be found in Faith #3 by Jody Houser, Francis Portela, and Marguerite Sauvage, Postal #11 by Bryan Hill and Isaac Goodhart, Jughead #5 by Chip Zdarsky and Erica Henderson, and so many more. 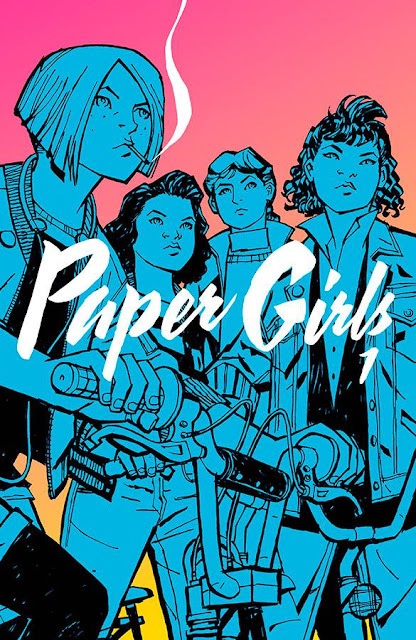 Make sure to pick up Brian K. Vaughan's other great series, Paper Girls, now in trade paperback. 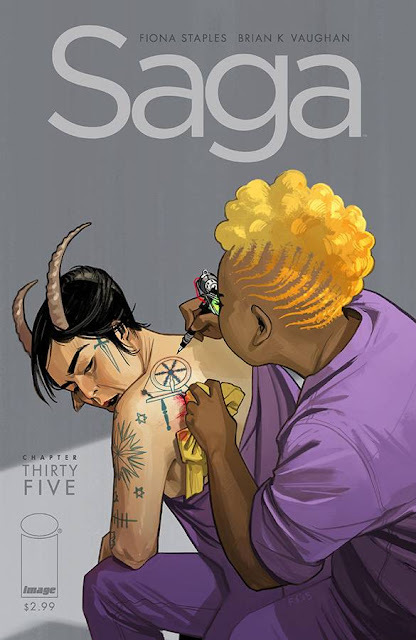 Saga #35 is out too. Happy reading! Demons at the corner store? Got a car that needs repairs and no money to fix it? 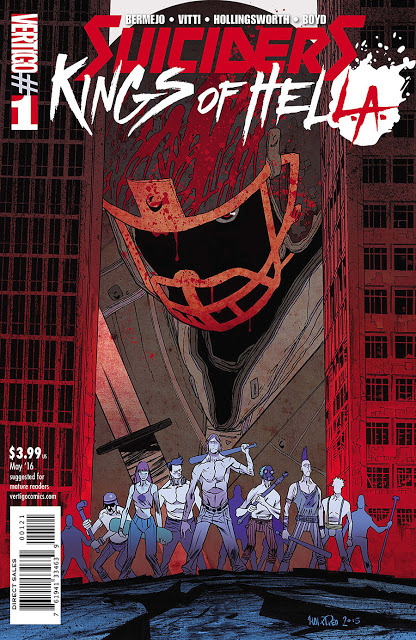 Riverdale High was just the beginning as Principal Stanger's despotic reach shuts down Pop's Shoppe! 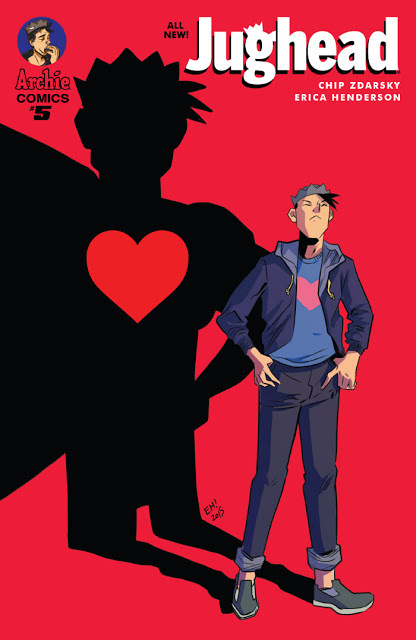 Jughead and the gang need to stop him once and for all! 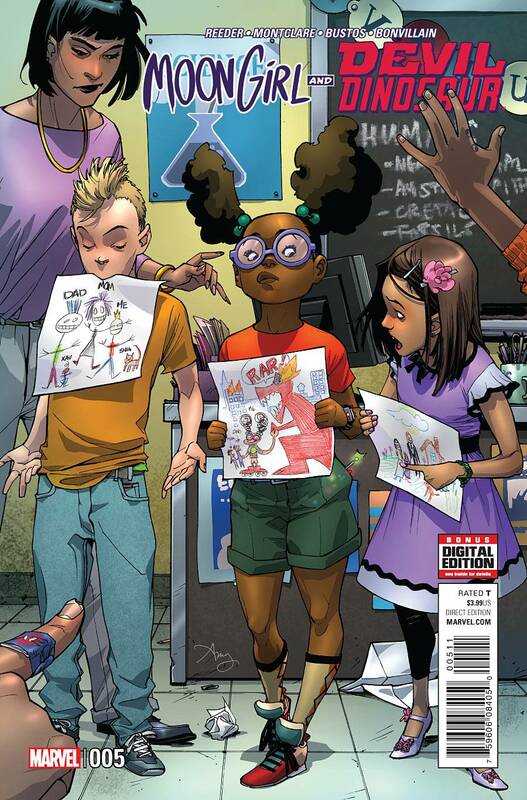 Maybe with the help of the SuperTeens and Iron Mantle? There's a chill in the air. 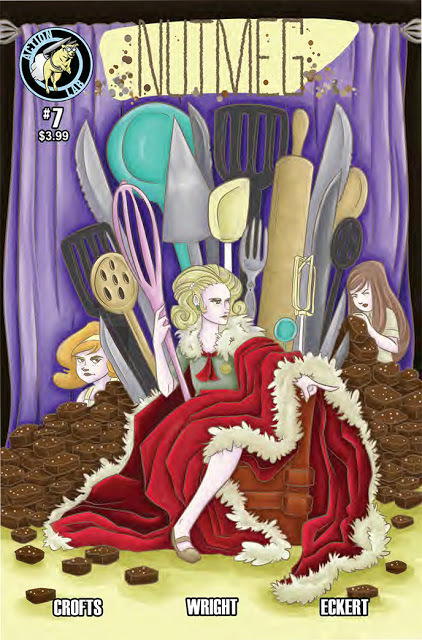 Saffron is still queen bee, but her throne is unstable. Majorie has some new friends. Ginger and Anise have nearly uncovered the mysterious "Patty" and "Patricia." And things are less than peachy between our criminal bakers Poppy and Cassia. Seasons change, mad things rearrange. "Eggman's Dozen" Part One: Dr. Eggman's plans for controlling the shattered world were going perfectly - until now! 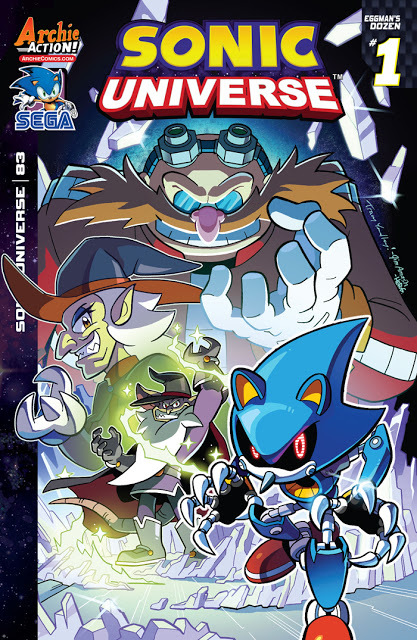 The wizard warlords, the Naugus Twins, have taken over Eggman's base and Dr. Eggman's source of Dark Gaia energy! No mere robots will do for this mission-the doctor's going to need all his Egg Bosses! Featuring cover art by Mr. Sonic comics himself, Tracy Yardley, and an "Evil Genius" variant by CG artist supreme, Rafa Knight! 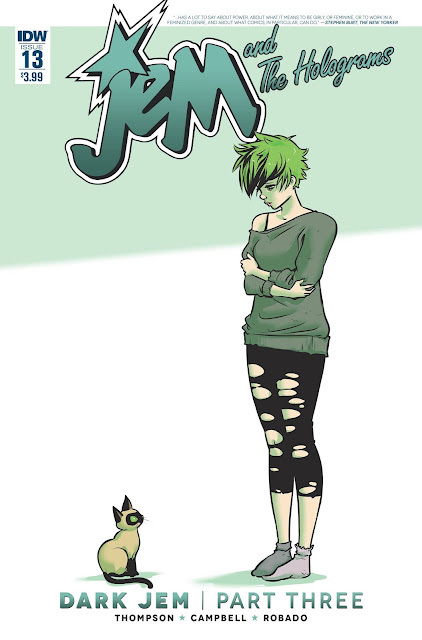 DARK JEM! Not only are JEM AND THE HOLOGRAMS not themselves but whatever is infecting them is now spreading to others every time they play. JERRICA, AJA, SHANA, and KIMBER band together-but will they be forced to destroy SYNERGY to save the world from the DARK JEM sound. Meanwhile Pizzazz makes plans to get back her band... at any cost! New job. New identity. New life... right? Will the sudden reappearance of a former Renegade bring Faith's newfound heights crashing back down to Earth? She's an intrepid reporter by day and an alien conspiracy hunting super hero by night - so the last thing Faith Herbert needed was her ex-boyfriend and one-time teammate Torque back in the picture. But he is. Does life have a "dislike" button? 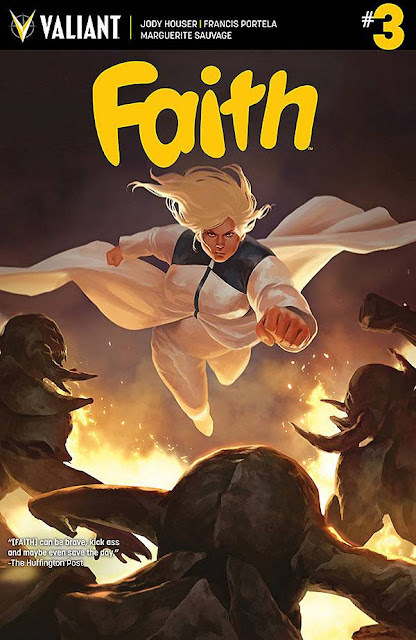 Rising star Jody Houser (Orphan Black) and sensational artists Francis Portela (Green Lantern) and Marguerite Sauvage (DC Comics Bombshells) continue Faith's landmark solo series debut! 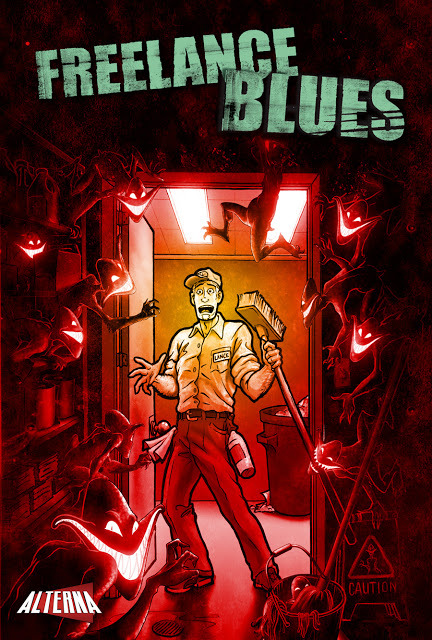 As Maggie recovers from Molly's attach, Mark and Laura Shiffron make a plan to punish and contain Molly, despite her protection order from the FBI, an FBI that Special Agent Bremble is beginning to turn against Eden itself... With the possible help of Mark's father, Issac. 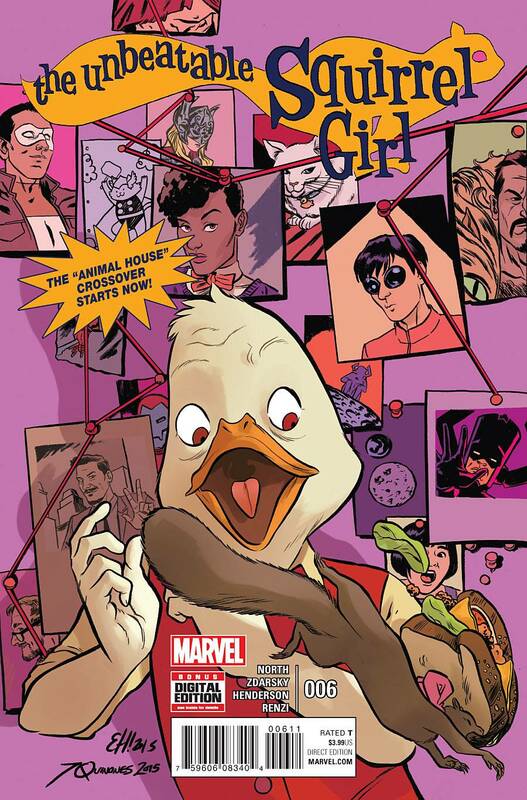 PART ONE OF "ANIMAL HOUSE," A CROSSOVER WITH HOWARD THE DUCK! • Squirrel Girl and Howard will team up against an enemy that neither Squirrel Girl (who has defeated Galactus) or Howard the Duck (who has defeated... uh... well, listen, I'm sure he's got other qualities) could take down on their own! • Will they fight over a trivial misunderstanding? Will they band together against a common enemy? Will Squirrel Girl say "duck!" to mean "lower your head" but Howard will misinterpret it as a call for his attention, leading him to get hit on the head by something? • At least ONE of those three questions will be answered with a "yes" in this issue! 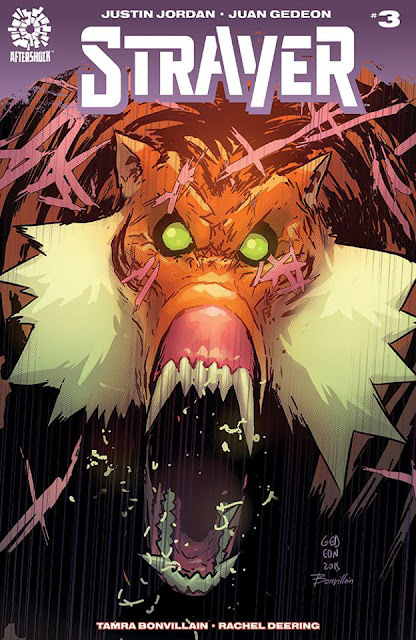 • CONCLUDED NEXT MONTH IN HOWARD THE DUCK #6! • What's a kid to do when the grown-ups think they know better than you? • But she better watch her back - 'cause the vicious KILLER FOLKS are getting used to modern life. And they're more formidable than ever! A local street hood surviving in a crime-infested ghetto has his life turned around when an ancient magic grants him superhuman powers-except his ability only activates in an upscale white community that may not accept him. Gritty, racially charged street-wise drama! The explosive revelations of issue #9 have turned all eyes toward Vega, and the Citadel must act fast to crush rebellion and maintain control over the most valuable resource in the cosmos. The Viceroy's first target? 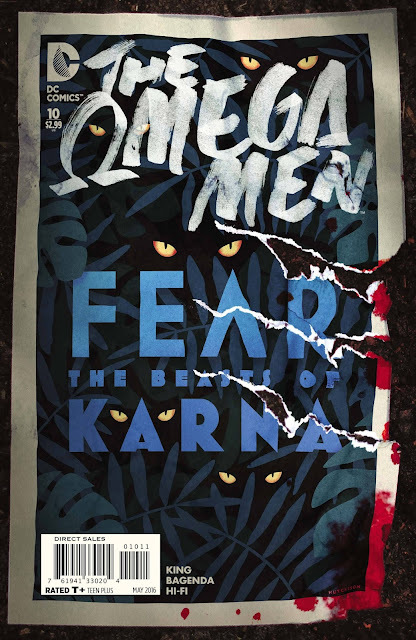 Karna, the insurgent, jungle homeworld of the Omega Man by whom he feels most betrayed: Tigorr, his own wayward son. The epic final act of DC's critically acclaimed space opera begins here! A whole generation has grown up since the Great Quake, and people like Trix and her brother Johnny don't know what life was like before New Angeles crumbled. Suffice to say, they've learned how to make the most of living inside the walled city, and particularly within their 'hood. 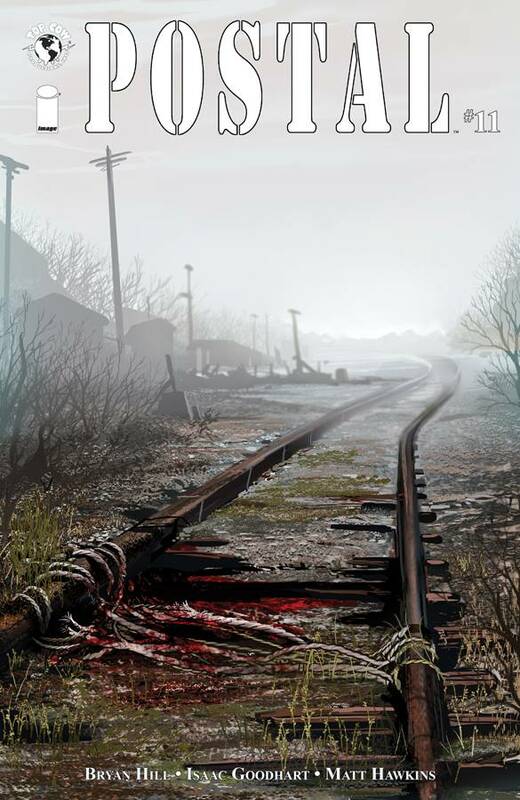 Johnny is the leader of the Kings of HelL.A., a street gang ready to protect its turf against any and all comers-though Johnny may have taken things too far when he crossed Leonard, a former Suicider known as the Coyote. Things are about to get a whole lot more violent. Meanwhile, Trix is finding love in the arms of Johnny's best friend, and their star-crossed romance is going to bring trouble of an entirely different kind. The second chapter in Lee Bermejo's acclaimed SUICIDERS series shows us a completely different side of life in New Angeles. Joining Bermejo for KINGS OF HELL.A. is artist Alessandro Vitti (RED LANTERNS), whose kinetic style perfectly fits SUICIDERS' brutal landscape.